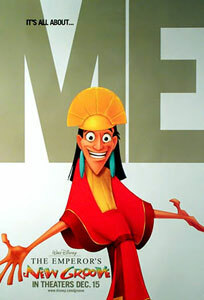 Probably my all-time favorite cartoon is “The Emperor’s New Groove.” The epically audacious Emperor Kuzco has been given everything in life. Really, he has no room to complain about anything. But this all ends one day when a peasant doesn’t want to give up his humble abode in order for Kuzco to build a personal resort. Shortly thereafter, Kuzco gets turned into a llama and loses any frame of reference for what he’s experiencing. What should be an overcomable obstacle becomes an end of the world scenario. Because he’s always been given whatever he wanted, a season of limitation results in a personal chaos and a (literally) meandering path back to comfort. We all struggle to sympathize with characters like Kuzco, Richie Rich, Cinderella’s step-sisters, and so on, who presume that they should always receive the best things in life. Those of us who are used to receiving very little in terms of preferential treatment or monetary freedom have a different floor of expectation. For us, a life of moderation is what we expect. We anticipate that our basic needs will be met and know that everything else is gravy. But there’s another perspective that we’re often reminded of. Many in the third world don’t even take for granted that they’ll have a meal or two each day. That we should expect meals and clothes and housing is scandalous in their minds. To them, the daily provision you anticipate is a glorious blessing. From Jesus’ perspective, God’s care for the day-to-day blessings we enjoy is the only reason why we exist today. God’s common grace is the only reason why all of humanity isn’t starving and sick, hammered daily by earthquakes and hurricanes, and suffering from the devastation of mass despotism. So in a sense, we’ve come to anticipate common grace. And that’s why I think theologians should adopt a new term for this teaching: “presumed grace.” Kuzco-like, we tend to presume that God’s restraint of darkness is the norm and that calamity is the rare exception. We feel like every pack of Pokemon cards (yes, I’m showing my age here) should be full of rare holographic cards. When we come up with a single common card, we flip out. We start to feel that we deserve God for to keep the chaos of a rebellious world at bay and to be provided with all of the things we feel we need. Let’s test our outlook with the following chaotic experiences: Tomorrow an earthquake kills hundreds. A relative is killed in a car accident with a drunk driver. You lose your retirement money in a stock crash. You get slandered in front of your friends and they buy it. Your adult child doesn’t want anything to do with you. A close friend is raped. Some of you don’t have to think very hard in order to envision one of these scenarios. I’ve recently experienced a measure of hurt in my life too. And what do we tell ourselves when we’re in the middle of a situation like this? We tell ourselves that we don’t deserve this hurt. We feel devastated that we have been given this pain. We see the event in isolation from the blessings that God has so richly given us. In that moment, we’ve presumed upon grace. Instead of presuming that we will receive pain and hurt and chaos in life, we’ve come to anticipate the opposite. Two conclusions seem plausible based on my consideration of presumed grace. First, I think that Christians should frame a better response to the academic pondering: “How can there be so much evil in the world and there still be a God?” Perhaps a better question is: “How can there be so much goodness in the world apart from a God?” We all see how the world turns to chaos and that the very possibility of life on planet earth seems but a fluke of flukes. So even our very existence and the stability of civilizations full of broken people like ourselves seems to be evidence of a good and gracious care of a Sovereign God. The second conclusion is closer to home. Believers who are enduring a season of chaos should let this circumstance reorient them to God’s grace. Instead of presuming upon God’s grace, we should let the dark times remind us of so much of the brightness of mercy we’ve received. Every day that we draw breath, experience the joy of friends and family, enjoy food and drink, or see another disaster-free day is a gift of God. I suppose that we suddenly experience this reorientation when God gives us a win after a season of darkness. We look around and find ourselves momentarily out of the mud of the last few months and look around; the freedom from the chaos is what I’ve enjoyed far too often. No more do we presume upon grace.